11 October 2017 Christine Alokit: Soybean is one of the cheapest protein sources that is used for various purposes for both human consumption and livestock feed. In human food, the grain can be roasted or fried and eaten as a snack, processed for multiple uses including soy-milk, cooking oil, infant weaning foods, kebabs and potential use in breweries. The soybean cake is used in processing animal feed. The various uses increase its demand yet the production is still low due to various constraints. In Nigeria, the yield gap is estimated at about 70% with farmers realizing average yields of 0.8 tonnes/hectare as compared to the potential yield of 2.7 tonnes/hectare. 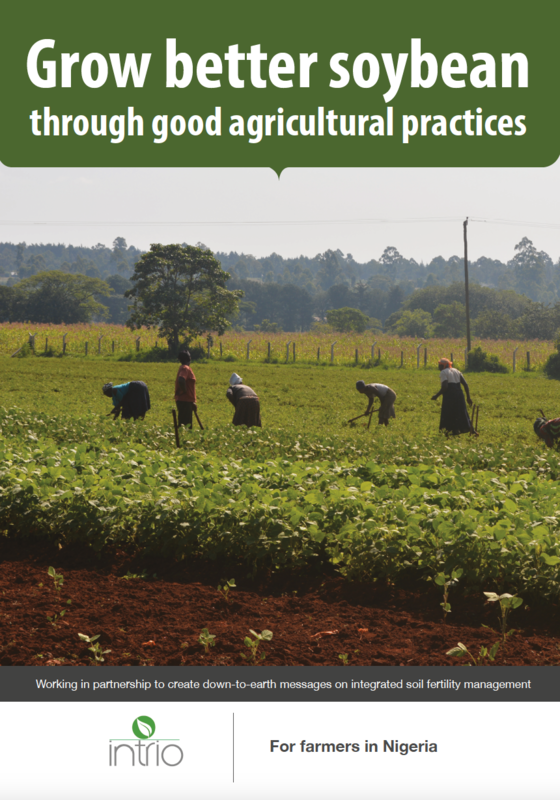 The low productivity is attributed to poor application of proper agronomic practices in aspects of minimal use of good quality improved seed, proper field management and the non-use of inoculants and fertilizers. Soybean roots have the ability to establish a mutually beneficial relationship with rhizobia, a nitrogen fixing bacteria during which the soybean plant produces nodules that house the bacteria cells. The bacteria in-turn fix nitrogen from the air into a form that can be used for the crop’s proper growth. Where this relationship is properly established, it is estimated that the amount of free nitrogen brought into the soil through the biological fixation is equivalent to over a 100 kg (two 50kg-bags) of urea per acre making soybean a good crop to grow in rotation with other crops. To effectively realize this, it is necessary to increase the nitrogen fixation through the introduction of strains of rhizobia to the soybean crop at planting, a process referred to as inoculation. 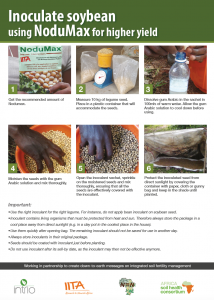 IITA has developed and is producing an effective soybean inoculant, NoduMax that is being marketed by private sector, INTRIO Synergy Limited (ISL). Farmers’ ability to properly apply NoduMax and other relevant agronomic practices is key in attaining better yields. 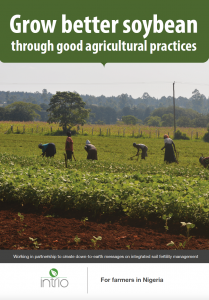 It is therefore important to equip farmers with adequate knowledge and skills. ASHC is working with ISL, IITA and other partners to run a scale-up campaign targeted at increasing soybean productivity through integrated soil fertility management (ISFM) in 9 States of Nigeria; Benue, Kwara, Niger, Kaduna, Kano, Borno, Kebbi, Sokoto and Federal Capital Territory (FCT) Abuja. The campaign that started in July 2017 will run up to end of season with a repeat in 2018. The campaign has a unique approach of combining multimedia approaches in a complementary manner as well as an innovative aspect of leveraging mobile technology penetration to disseminate short farmer educational video clips. It is expected to reach out information to estimated 40,000 farmers through radio, print messages and mobile videos. The team is currently airing jingles and live 30-minute studio discussions on Harvest FM radio in Benue in English and Pidgin covering all the cropping cycle. Posters and flip charts are being developed and will be distributed to agricultural extension workers and agro-dealers to further support farmers’ acquisition of knowledge and skills. Additionally, short videos showing step-by-step shots demonstrating appropriate methods from land preparation, inoculation, planting, fertilizer application and field crop management will be screened through projectors in video screening centres and shared through mobile phones through extension agents, agro dealers and village promoters. In the short-run, the campaign is expected to improve farmers’ knowledge and skills on soybean production through use of improved seed, proper application of NoduMax inoculant, fertilizers, herbicides and field management practices. This is will lead to increased productivity thereby contribute to a reduction in the current soybean yield gap in the country. Given the crop’s potential to boost soil fertility, in the long run continuous use of ISFM should impact on soil fertility and contribute to the control the parasitic weed Striga hermonthica.